Real-time entity resolution is the process of matching query records in sub-second time with records in a database that represent the same real-world entity. 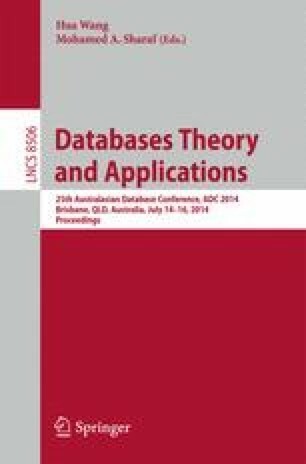 Indexing techniques are used to efficiently extract a set of candidate records from the database that are similar to a query record, and that are then compared with the query record in more details. The sorted neighborhood indexing method, which sorts a database and compares records within a sliding window, has successfully been used for entity resolution of very large databases. However, because it is based on static sorted arrays, this technique is not suitable for dynamic databases. We propose a tree-based dynamic sorted neighborhood index that facilitates matching a stream of query records against a large and dynamic database in real-time. We evaluate our approach on two large data sets. Our results show that the times for both inserting and querying of records stays nearly constant as the index grows, and our approach achieves over one magnitude faster indexing and querying times compared to an earlier real-time entity resolution technique with comparable high matching accuracy. This research was funded by the Australian Research Council (ARC), Veda, and Funnelback Pty. Ltd., under Linkage Project LP100200079.